This giveaway is now closed. Thank you all so much for entering! This is a joint giveaway with The ArtsyMama and Natural Parents Network. You may enter at one site only. Please find the section marked “Win it!” for the mandatory main entry and optional bonus entries. Roundhouse Design Collaborative is offering our readers a giveaway of an Oh Plah! 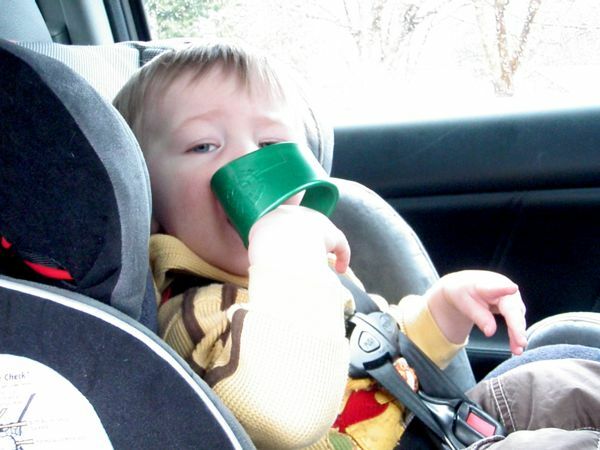 Teething Cuff! This latex-free, BPA-free, phthalate-free, recyclable teething bracelet looks perfect on parents, but it’s safe and fun for babies and kids to play with, bend, twist, and chew. This giveaway is open to US, Canadian, and EU addresses. 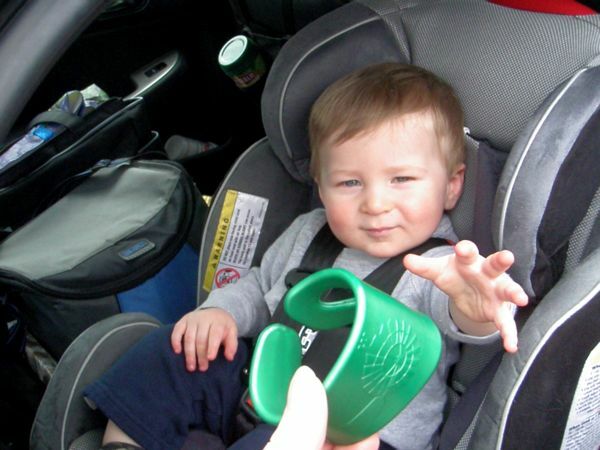 I was searching for travel-friendly items that I could review for my upcoming road trip with Little Man in April and I came across this product called the Oh Plah! Teething Bracelet. As I looked at the product description I began to get excited: it is latex free! Little Man and I are both allergic to latex, and it is sometimes difficult to find products that do not contain natural rubber or latex even though we would love to try them. I contacted Caryn Paradis, founder of Roundhouse and explained who I was, why I was interested in her product and that I wanted to test her product. Caryn was so nice when she replied to my email and let me know that even though my blog, The ArtsyMama, is small she was interested in having me review her product because of our latex issues and that I live in the same state as her company. It was kismet and I was thrilled! Caryn sent us the green Oh Plah! with the windmill design for our review. It arrived in a little box with very simple cardboard packaging. The bracelet slipped out easily and onto my wrist. After I admired it a bit, I washed it as per the instructions and let Little Man have a try. Green is his favorite color and he immediately stared at the cuff and turned it around in his hands to study it some more. He placed it on his wrist and smiled at me. The first time he was introduced to the bracelet he played with it for 30 minutes. In Little Man time that is an eternity. I was beginning to think I might not get it back. When he did stop playing with it, I washed, dried and replaced it on my wrist. I wore the Oh Plah! every day for two weeks. I wanted to see if I would be able to continue about my daily tasks without the bracelet getting in the way, me losing it, or having a skin reaction to the thermoplastic. I had trouble at first figuring out which wrist and direction was best for me to wear it on. I tried it on both wrists and having the curved part face both up and down on each wrist. I ended up liking my right wrist with the curve down. I found that this position was the least inhibitive of wrist movement. The band did not get in my way otherwise. It did get caught taking off my bulky jacket but that turned into fun for Little Man as he chased the rolling bracelet. 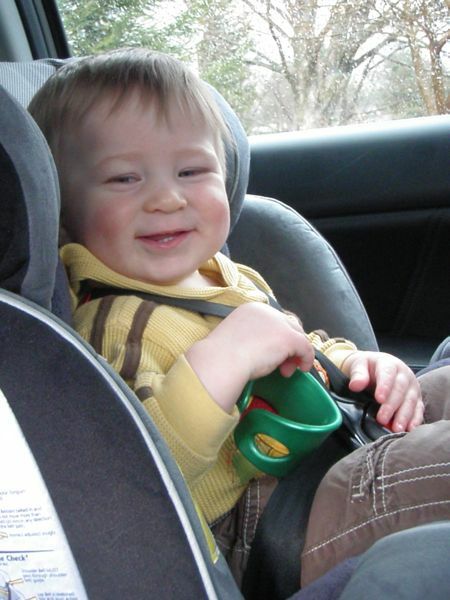 A note about the loose seatbelt straps: This was mid-buckling! The bracelet rarely got icky, which is a plus. Its smooth surface did not allow things to become stuck in the design or its surface. It was a snap to clean too — a quick once-over with the sponge, rinse and onto the drying rack. While we were out, if the soap I was using was mild enough I could wash it while I washed my hands. I did have to make sure the area between my skin and the cuff was dry, though, because I got a little chafing rash otherwise. This is probably the most fun, versatile and simple toy we have right now. 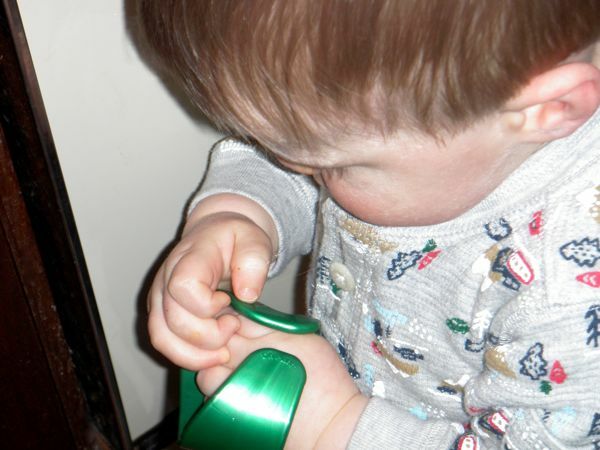 Little Man is not much of a biter when he teethes, but he does love to manipulate objects with his hands. 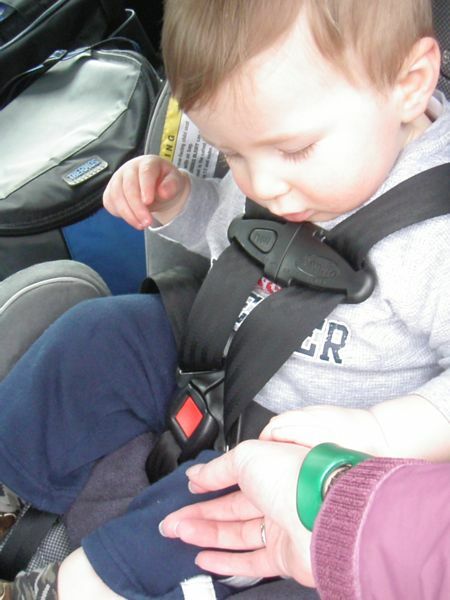 It has become part of our daily ritual as I put him in the carseat — he takes the bracelet from my wrist and plays during our car ride home. It keeps him occupied during our car trips. He squishes, stretches, wears, bites and studies the Oh Plah! It has not lost its shape, shine or design either. As an adult with a bit of an attention issue, the Oh Plah! has helped me too during the day. I typically am one of those annoying pen clickers. I’ve replaced pen clicking with Oh Plah! squishing — it is much quieter and less annoying to those around me. The Oh Plah! was light and comfortable enough after the initial figuring out of how I prefer to wear it for me to forget it is there — which is a must for any piece of mommy jewelry. I was able to wear it all day at work, and then when I went to pick up Little Man was confident enough to pass it off to him to play with in the carseat on the ride home. The Oh Plah! is made of medical grade thermoplastic, nontoxic, bacteria-resistant, and is free of lead, latex, PVC, BPA and phthalates. On the green note, I am fully impressed that when we are finished with our Oh Plah! I can return it to Roundhouse for recycling. Hooray for ecologically responsible companies! You can purchase your own Oh Plah! Teething Cuff at Roundhouse Design Collaborative’s website. They sell for $14.99. The Oh Plah! comes in six different colors and designs. I’m thinking I need another so Little Man and I can each have one; I’m partial to the blue myself. MAIN ENTRY: Visit Roundhouse Design Collaborative and tell us something interesting about the company! 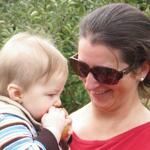 This is a joint giveaway with The ArtsyMama, the natural parenting blog of a full-time working mother, and Natural Parents Network. You may enter at one site only, and we’ll be recording IP addresses to ensure that there are no duplicate entries. That said, please do visit and enjoy both sites! Tell us which color and design is your favorite. Tell us who will enjoy your new Oh Plah! Follow The ArtsyMama blog publicly through Google Friend Connect. Leave a relevant comment on a non-giveaway article at The ArtsyMama and tell us which post (comment on separate posts for up to 3 entries total). Like Roundhouse Design Collaborative on Facebook. Like The ArtsyMama on Facebook. Post this giveaway on your Facebook page or wall and leave the link (1 entry). You can use this status update: Enter to win a chic and functional Oh Plah! 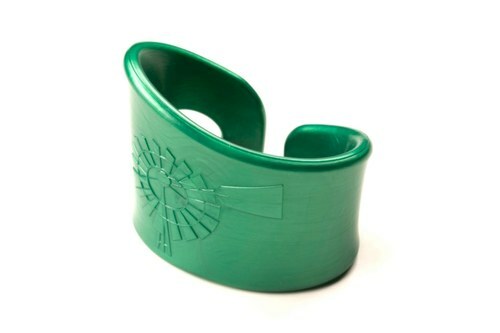 Teething Cuff by @Roundhouse Design Collaborative from @The ArtsyMama and @Natural Parents Network. Contest ends May 3 and is open to US, Canada, & EU. Follow @OhPlah on Twitter and leave your Twitter name in the comment. Put the Natural Parents Network badge on your website or add http://NaturalParentsNetwork.com to your text blogroll for 2 extra entries each. The HTML code for the badge is in the sidebar to the right on Natural Parents Network. Leave your site URL in the comment. Put The ArtsyMama badge on your website or add http://theartsymama.blogspot.com/ to your text blogroll for 2 extra entries each. The HTML code is in the right sidebar of The ArtsyMama. Leave your site URL in the comment. Contest open to U.S., Canadian, and EU mailing addresses. Contestants may enter at either The ArtsyMama or Natural Parents Network but not both. Entries will be combined for the drawing of a single winner. Contest closes May 3 at 11:59 p.m. PST. an Oh Plah! Teething Cuff for review. The ArtsyMama is is an artist, high school art teacher, field hockey coach, wife, and mother to a mischievous little boy. After the birth of her son, she experienced difficulty breastfeeding, and under some poor advice, started expressing her milk instead. She almost had to give up when after two months her supply dropped and she could no longer express enough milk. She was finally introduced to kangaroo care by a friend; after that excellent experiences she dove head long into attachment parenting theory and has not looked back. In between work, pumping, breastfeeding, changing cloth diapers and neglecting housework, she finds time for a little self-therapy by writing her blog. She blogs about breastfeeding, expressing at work, and cloth diapering at The ArtsyMama. I found it interesting that Roadhouse Design Collaborative donates some of its profits to Healthy Child Healthy World. We’re about to take a long plane ride next month and I know my son would enjoy an Oh Plah! Teething Bracelet. Roundhouse Design was started by a mom who wanted to make a better, easier to use ring sling… and it’s actually pretty darn cool! I love the blue harmony style. I subscribe to NPN in google reader. OhPlah means “Here you go” in French! 🙂 That’s something interesting to me that I found on the website! My favorite color and design is Whimsy in Purple with the flower on it. That purple is great! My little teething 10 month old, Dominic, will enjoy this OhPlah! He chews on EVERYTHING! I subscribed to Natural Parents Network by email! I subscribed to Natural Parents Network with Google Reader! I followed The Artsy Mama blog publicly through GFC! I Like Roundhouse Design Collaborative on Facebook! I Like The ArtsyMama on Facebook.